This are the Princess Mimi Sesame Grey Circle Lens by Tsubasa Masuwaka. They are also available in Chocolate Brown and Apple Green and retail for $23.90 (£15.57). These are the second pair of circle lenses I have ever brought and its my favorite. ^_^ I did purchase these online from CandyLens.com and was very happy with their service so I do recommend them. As you can see in the picture above their packaging definitely has to be the kawaii-est! The lenses are very vibrant! Even in dim lighting, you are able to see the colour. During day light, the lenses do make your eyes pop! Trust me, whenever you wear them people will complement your eyes without fail like "woowwww your eyes" ahahha. Not only that, but they show up really nicely in photos too, regardless of the lighting and quality of the camera. The first selfie, was taken (on a mac webcam) against the sunlight, so the lighting was dim. But they still manage to give a pop to your eyes and show up. This selfie is taken outdoors with natural sunlight. 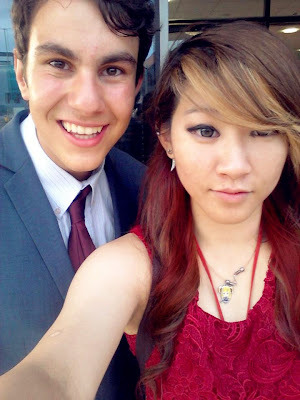 ( didnt take any decent photos outside that day LOL, so say hi to my friend Leo ahahha). The colour is more vibrant in brighter lighting.